August 5th, 2013, BC Day today and therefore a holiday. What a better thing to do on a holiday or any day than to venture off to the Vancouver Aquarium and that is exactly what MomMomOnTheGo and her family did today. We (being two adults, our 10 year old girl and our 6 year old girl) arrived at the Vancouver Aquarium at 11:00 am and stayed until 3:30 pm. Four and a half hours of Vancouver Aquarium excitement and we could have stayed longer. My Little One was complaining about leaving when we finally did leave! You can quite easily spend an entire day at the Vancouver Aquarium. I highly recommend that you plan to spend a good part of your day at the Vancouver Aquarium when you venture off to enjoy it. My family feels extremely blessed to live so close to the Vancouver Aquarium. Today was not the first time that we have been to the Vancouver Aquarium and it will definitely not be our last time. I love that the Vancouver Aquarium is always getting new shows or themes to their displays. 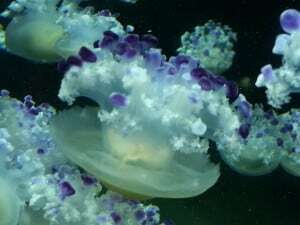 Right now, the newest attraction is Jelly Invasion and the Jelly Fish that you can see are spectacular. Make sure to also check out the Jelly Invasion Photo Contest….Details HERE….The prizes are AMAZING! 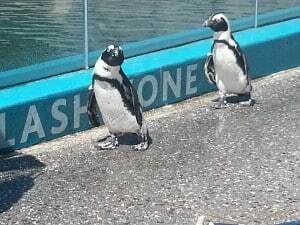 Another amazing newer addition to the Vancouver Aquarium are the seven Penguins. We loved the Penguin display and the all new Penguin walk about. My Little One is so in love with Penguins and you can imagine her glory when they went waddling by in front of us. They are absolutely adorable and amazing to watch. Of course one of the things we love to watch every single time we go to the Vancouver Aquarium are the sea otters and the amazing Dolphins. No matter how many times we see the Dolphins, we always want to go back for more. 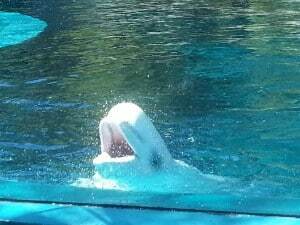 of course we also have to stop and visit the Beluga Whales. This time we braved the Splash Zone! Yes, we sat in the Splash Zone and it was a refreshing way to cool down on such a hot day. A must see every time is the 4D movie. You can buy your Vancouver Aquarium tickets and membership online and avoid the line ups. Please remember that it only takes two visits a year to make a membership to the Vancouver Aquarium pay for itself. If you are a Vancouver Aquarium member you also save on your purchases at the cafeteria and their on site memorabilia stores. I really could go on forever about the Vancouver Aquarium and how much my entire family loves it. To browse all the displays that are at the Vancouver Aquarium, make sure to visit the Vancouver Aquarium Exhibits & Galleries Page. 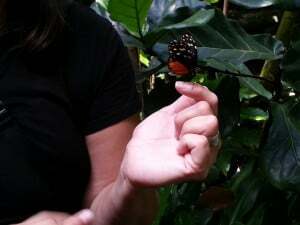 My favorite moment today is hard to pick, but I think it was when I was going through the Tropical Zone and the butterfly landed on my finger. I have always wanted to have a butterfly on my finger and today it was realized! MomMomOnTheGo highly and extremely recommends that you visit the Vancouver Aquarium. We LOVE it so much. Watch this awesome video of MomMomOnTheGo and family out on their day at the Vancouver Aquarium. Disclosure: MomMomOnTheGo was provided product for the purpose of conducting this review. As always, MomMomOnTheGo only supports companies and products that she loves. All opinions expressed herein are those of MomMomOnTheGo. I’d love to see the jellyfish! We’re most excited at seeing the jelly fish.. Still one of my favourite places to go!! Ah we love the aquarium! Haven’t seen the penguins yet so would love a chance too! We love it all. There is no part of the aquarium that we bypass or rush through. You can’t just go for an hour, it’s always a long visit. The Vancouver Aquarium is a fantastic place for a family day out but it’s an expensive day ou too so this is a great competition. Good luck everybody. Haven’t went to aquarium for ages! Would definitely bring kids and have some fun. Love to see the penguins!! !